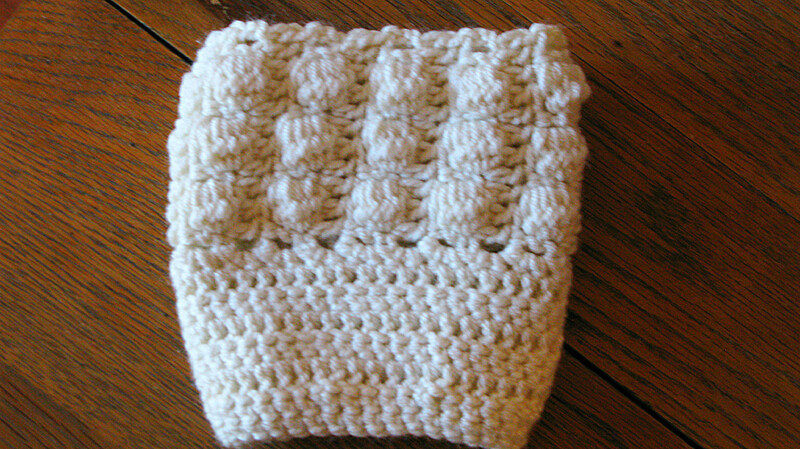 Here’s another free boot cuff pattern. I really like the way this cuff turn out. Now I’m ready to see what it looks like in some different colors. I hope you enjoy this pattern and if there are any errors, please feel free to let me know! The only way to improve is feedback! UPDATE 02/03/13 – I had an error and had an additional row of dc’s. This has been corrected. I am sorry for the confusion. 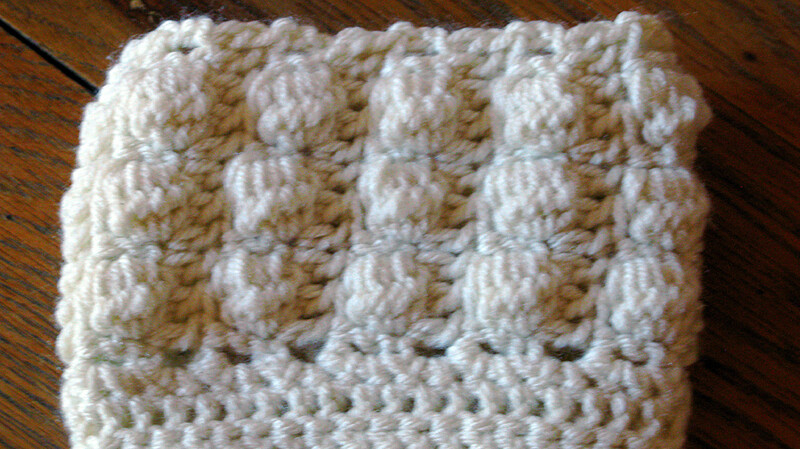 I used I LoveThis Yarn medium (4) worsted weight. The color I used was ivory. (YO, insert hook around post of last dc, YO and pull up a loop, YO and draw through 2 loops on hook) 5 times, YO and draw through all 6 loops on hook. Gauge: 8 stitches and 3 Rows = approximately 2 inches. Repeat rows 2 and 3 until the desired measurement ending with row 3. Fasten off leaving a long tail. Turn pattern wrong side out and join ends together using the long tail and take the side just fastened off using the tapestry needle to sew the front loop only of the stitch and the bottom loop of each sc on the first row. Fasten off and weave in the ends. Turn pattern right side in before working the bottom part of the cuff. Row 2: ch 2, dc in next sc and around, Sl st in top of ch 2 st.
Row 4: ch 2, dc in next sc and around, Sl st in top of ch 2 st.
Row 6: ch 2, dc in next sc and around, Sl st in top of ch 2 st.
Row 7: ch 1 and sc in same space, sc in next 3 sts, *skip next sc, sc in next 4 st*, repeat from * to * across, sl st in first sc. Row 8: ch 2 and hdc in next sc and around, sl st in top of ch 2 st.
Row 9: ch 1 and sc in same sp, sc in next hdc and around, sl st in first sc. Fasten off and weave in ends. Please feel free to make or sell products from this pattern! I believe in free enterprise but just ask to link back to my site. Please do not copy this pattern as your own. Please do not re-publish photos as your own. You can also follow me on my ELK Studio Facebook page for updates of upcoming pattern releases! It’s been quite a while since I’ve looked at the pattern. I’ll check it out to make sure I don’t have any mistakes. Thank you! Thank you so very much for your patterns for the boot cuffs! I just recently heard about them and have made one pair for my 8yr old granddaughter. But your patterns are so much more stylish than the one I made. I am looking forward to making some from your pattern for Christmas gifts this year!